It is no secret that we are big fans of stylus ‘pens’ when drawing and writing on our iPads. After the Minis hit the office on Friday, it was interesting to hear how many of the team was looking to use the smaller size device as a quick not taker. Which means, everyone dug out every stylus they had tossed in their computer bag to see what really works. When a new stylus comes out, we buy it and write about what we like and don’t like about it. Rather than looking at the stylus, this time we were looking at our ability to get to the note taking and move on. When looking at a stylus with these concerns, it becomes more apparent that most stylus reviews are overlooking the real work side of using a stylus with an iPad. Usually, the review covers how the stylus feels in a person’s hand, it’s weight and a bit about it’s interaction with apps. 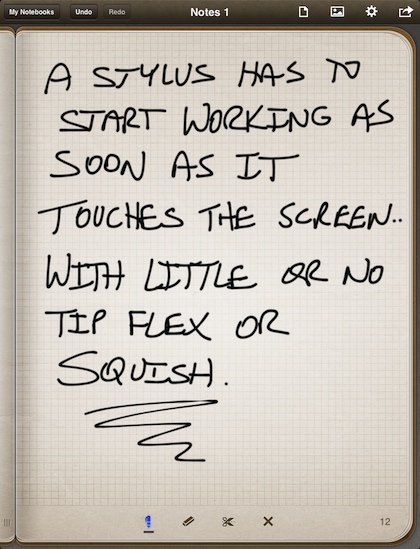 When styluses started coming out for the first iPad, the tips squished a bit. We thought that was how the stylus designer was getting a bigger contact area on the screen to mimic a finger. Now though, screens, processors and software handle a relatively small touch points. Now… that squish means less precision and bad feedback. Whipping the Mini out of our bag and starting to write showed us that poor quality rubber tips had two issues. There was the collapsing tips that causes an uncertainty of when the stylus is ‘writing’ a line and when you will end up with no line. There is also the quality of the rubber tip. One pen we picked up through Kickstarter has a wonderful knurled grip and click to hide the tip. The capacitance of the tip is all wrong though we the pen has to have just the right amount of pressure on it against the screen, otherwise the drawn line skips a lot. Another Kickstarter project we have enjoyed watching grow, a simple ‘Made in the USA’ stylus tip in a pen cap, has shipped. Then, the creator went back and started doing more tuning. There isn’t three sizes anymore, the only tip sold is the one for a Bic Pen… very nice! The tip is now harder so there is no squish as well the capacitance if correct so the line starts being drawn as soon as the tip touches the screen. When the quality is there, people stop worry about what is actually ending up on the screen and you start seeing people writing notes without looking at the screen! Check out the More-Real site for ‘more’ information. Several companies make a solid clear plastic tipped stylus. The best known is the Adonit stylus. 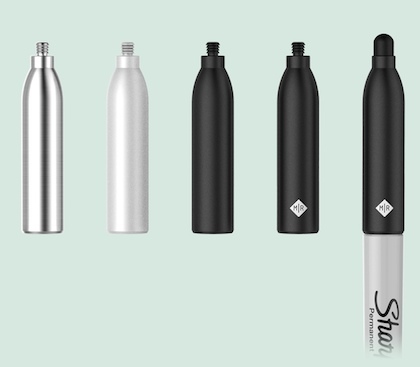 There is a variety of pen body styles they offer, but the plastic tip is similar across the whole line. The plastic disc is at the end of a metal shaft, which most people think does the actual writing. No, the clear plastic is the reference the iPad uses, the size of the line is set by the app, not the stylus. While the hard clear disc makes a very solid contact with the screen and there is no question if a line will be drawn, it is a solid hitting a solid, thus a tap-tap-tap noise when writing. Adonit does a pressure sensitive stylus too. After we got past the play time with the pressure sensitive technology, we noticed that due to the shaft floating a bit there was a lot less noise when using. The movement is actually very minimal so it doesn’t feel like writing with a squishy rubber tip. 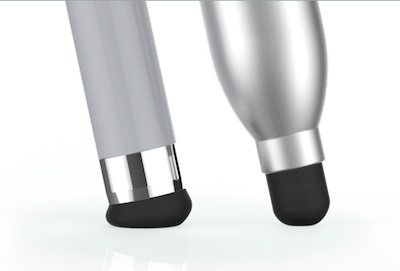 Last week, Adonit introduced a new version of their Pro stylus. The clear plastic disc is slight smaller and the tip is on a dampener. You know when you have made contact, a line is drawn and there is a lot less of the tick-tick of plastic on glass. Both have a different users that claim their stylus is better. The Adonit with precision lines and the More-Real with an artist feel.